Location, location, location…shout property agents. That being true, they’d be delirious over the ‘Rustic Stone’ restaurant in downtown Dublin. Doubly so, after tasting the food there. A short stroll from Trinity College where literary luminaries such as Oscar Wilde, Samuel Becket and the inaugural Laureate for Irish Fiction, Anne Enright, developed their penmanship, this corner restaurant on South George’s Street also stands across from one of Dublin’s most trendy areas, Temple Bar. And if that’s not enough, a quaint enclosed market is a stone’s throw away. As many owners will attest, location is key to kick-starting a restaurant but it’s consistent quality and presentation of food that keeps clients walking through the doors. On this score, Dylan McGrath and his team have little to worry about. Visiting recently with a prominent telecoms CEO and his wife during a break between sessions at the annual Dublin Book Festival, we enjoyed a cozy lunch enhanced by efficient service from Efti, our friendly Greek waitress. The menu created by Dylan – defined as ‘healthy eating’ – is exciting by its sheer attention to detail, all items being labeled with one or more of seven characteristics – low saturated fat, wheat free gluten, free dairy free, vegetarian, super food and sugar free. Feeling in the mood for tapas-style eating? The ‘Bites’ menu is probably more suitable – eight items ranging from salt cod brandad – salt cured cod crushed with onion potato parsley fried in rice bran oil with sweet onion, low fat crème fraiche and shaved ham, to duck ‘n’ beef sandwiches – no bread, just salt cured beef and citrus scented duck sandwiched with herb goats cheese and the chef’s own mango chutney. On the theme of ‘healthy eating,’ comments with each dish act as helpful guides: ‘Fish promotes a healthy heart and boosts our immune system. Onions are packed with potassium and chromium. Great for promoting weight loss’ after the former and, ‘Goats cheese is excellent for those who are lactose intolerant’ for the latter. The traditional à la carte menu is equally diverse, including eight starters plus six distinct salads with memorable names such as ‘boisterous beetroot’ composed of shaved fennel, baby gems, floppy lettuce, avocado, radicchio, chicory with pink grapefruit, pink radish, dill, beetroot and caramel pine nut dressed in its own beetroot juice split with olive oil. ‘A super all-round liver cleanse,’ as the accompanying commentary explains. Being light eaters, my guests chose soup and salad. 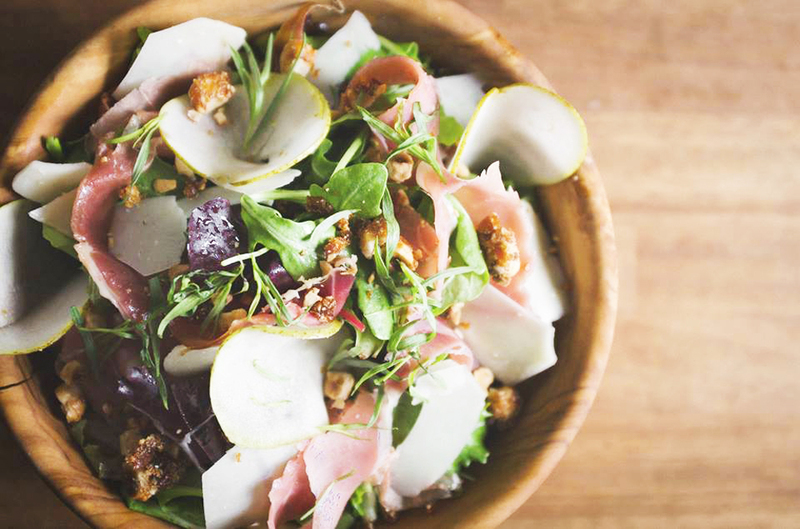 The mighty mustard salad -wild rocket, sliced prosciutto ham, shaved crisp slices of pear with toasted hazelnuts, parmesan and wild herbs dressed in a light mustard dressing – was so generous, it was a meal onto itself. 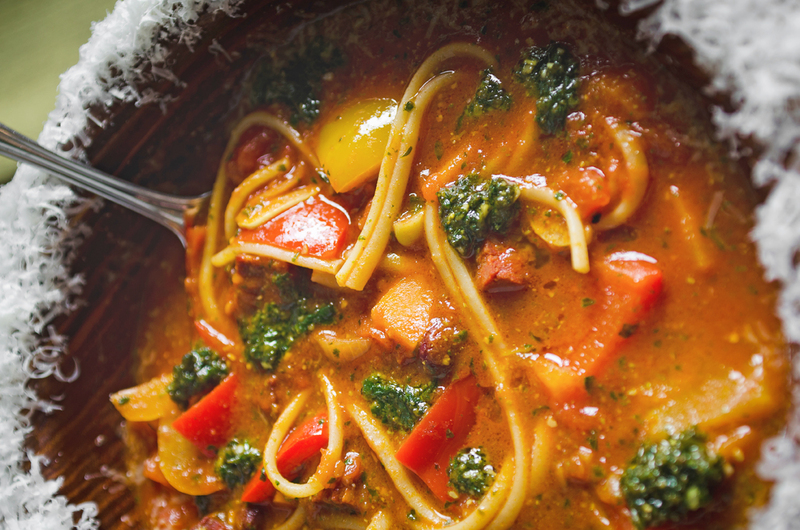 Requiring something warm and hearty, my CEO acquaintance opted for the thick borlotti bean minestrone soup with chorizo – chunky vegetables in a deep bowl delicately flavored with basil, Parmesan and olive oil. ‘Has a protein base and is high in fibre… A perfect dish for those on a low glycemic index diet,’ reads the informative blurb. ‘Bread ‘N’ Dips,’ a selection of organic, sour and chunky breads with cumin scented hummus and baba ganoush bound with hazelnut oil, accompanied the dishes. My choice of starter was from the special ‘Raw’ menu, dishes lightly cooked – a refreshing dish of three thin mango slices wrapped around a filling of coriander, crabmeat and radish. I also learned that, ‘Eating mangos improves skin and hair condition.’ Saves a visit to the beauty salon. 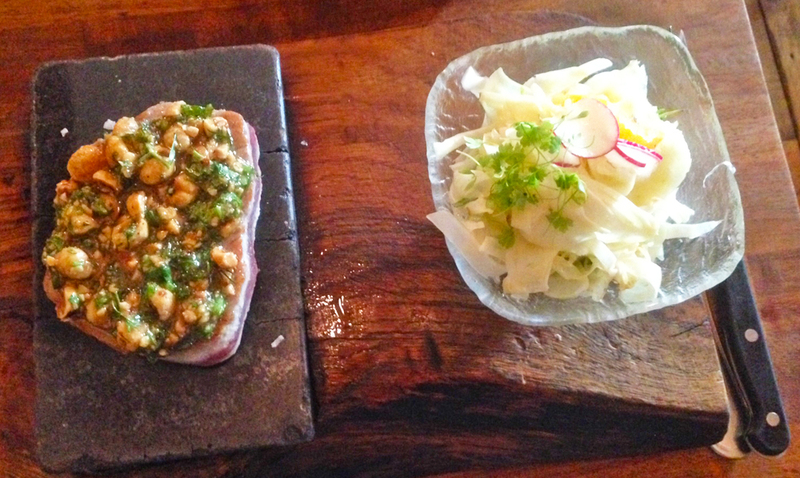 It would have been unforgivable to depart ‘Rustic Stone’ without indulging in one of its ‘On the Stone’ specialties – that said, it wasn’t an easy choice. Eight tantalizing items vie for attention, including fillet of beef with mushrooms and tarragon, halibut with walnut relish and rump of beef with basil and pine nuts. 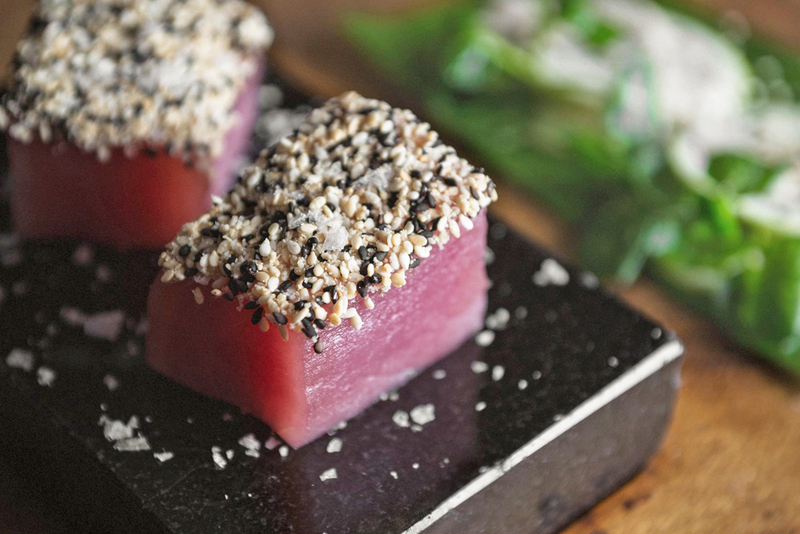 In the end, I turned to a faithful favorite fish – tuna. Arriving on a hot lava stone, the soft steak, sizzling slightly, was delicately flavored with coriander, dill basil and rocket, with a hint of orange and confit ginger. Light yet filling, it was enriched by the crunchy earthiness of the nuts. I owe a debt to the ever-watchful Efti who, noticing I was deeply engaged in conversation and leaving the meat on the stone too long, politely informed me I might wish to move it to the plate and put small pieces back when they required further grilling. Dylan, known as an intense, outspoken and passionate chef, is as meticulous about his desserts as he is about the other menu segments, with an exotic range featuring such combos as fruit sushi with sticky rice, surprise wasabi and caramel passion fruit sauce and cherry tea flavored panna cotta with almond tart. When the weather is damp and cold I consider chocolate the finest of companions, so my choice was easy – chocolate soup with chocolate mousse, a dreamlike double helping. Poured gracefully from a glass decanter aka as if from a sommelier, it was one of the smoothest chocolate liquids I’ve experienced in a very long time, its rich aroma enhanced with roasted grated hazelnut. Hard to believe it was sugar free. Considering the daring blend of ingredients in his dishes, their sheer diversity and innovative presentation, it is little surprise to learn that Dylan held Michelin stars and is a judge on Ireland’s hit show, ‘Masterchef.’ His reputation is much extolled, and in the case of the ‘Rustic Stone’ rightly so, for it adds a new dimension to Dublin’s varied restaurant landscape. 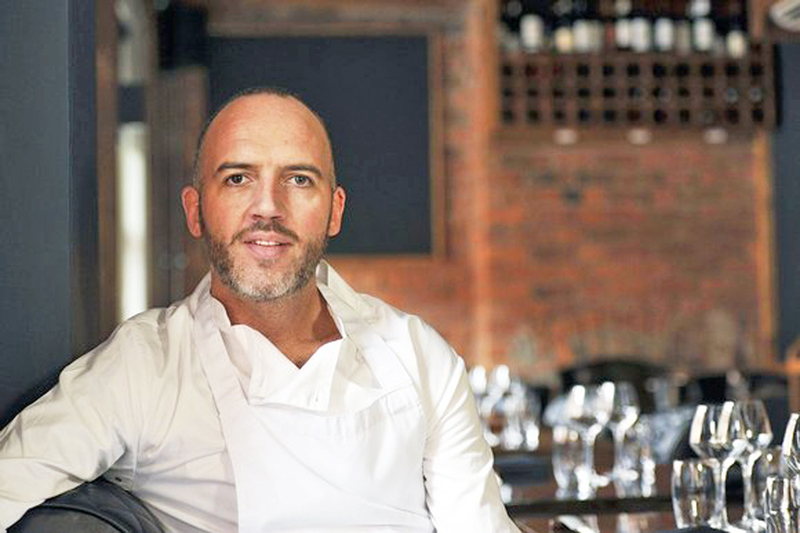 Posted in RestaurantsTagged Best restaurants in Dublin, celebrity chefs Ireland, Dylan McGrath chef, healthy eating, healthy food Ireland, Michelin star chef Dublin, Rustic Stone restaurant Dublin, where to lunch in DublinBookmark the permalink.